The Alex Theatre was brimming with Christmas cheer on December 22, in "A Holly Jolly Christmas!" The concert was for the benefit of Immaculate Heart of Mary Church and School and the audience came in droves to support local artists and special guest MARTIN NIEVERA. 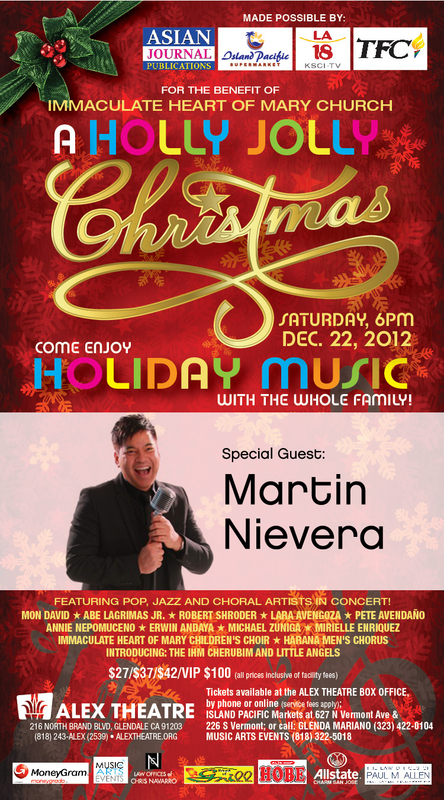 Nievera was a highly-anticipated last-minute addition, who generously took the time from his commitments to perform a couple of Christmas songs and a duet with ANNIE NEPOMUCENO. The concert was backed by a 5-piece band, led by FASO Conductor ROBERT SHRODER, who surprised everyone by playing not only the flute, but jazz saxophone as well. The stage was overflowing with talent, topbilled by the IHM CHILDREN'S CHOIR who had one of its busiest weekends (also performing at the 53rd LA County Holiday Celebration a day later). The IHM Choir was joined by a younger group formed by Music Director PETE AVENDAÑO, the IHM CHERUBIM, who also performed the cutest "Rudolph The Red-Nosed Reindeer" with jazz vocalist MON DAVID. Mon David also did an exciting drum and vocal repartee with ABE LAGRIMAS Jr., who also wowed the crowd with his ukulele jazz version of "O Tannenbaum." With calls for "more!" during their segment was the HARANA MEN'S CHORUS, who changed from their colorful barongs to shirts and ties, befitting the crowd favorite "Jersey Boys Medley." From the Harana, impressive tenor soloists ERWIN ANDAYA and MIKE ZUÑIGA sang Christmas favorites. Disney princess LARA AVENGOZA (Aladdin's Jasmine) glowed onstage and enthralled the audience with her lovely voice. In one of the most engaging performances of the night, 10-year old MIRIELLE ENRIQUEZ's heartwarming "Give Love On Christmas Day" inspired us to do just that. See us on Kababayan LA! View our TFC TV ad below! Watch a fan video from the concert!